A fanniversary… sounds a bit rude, if you happen to hail from the Atlantic Isles. Here in the land of the “fanny pack” it doesn’t have the same humorous effect. But how did “fanny” come to refer to lady bits? Is there something Jane Austen wasn’t telling us about prim Fanny Price? 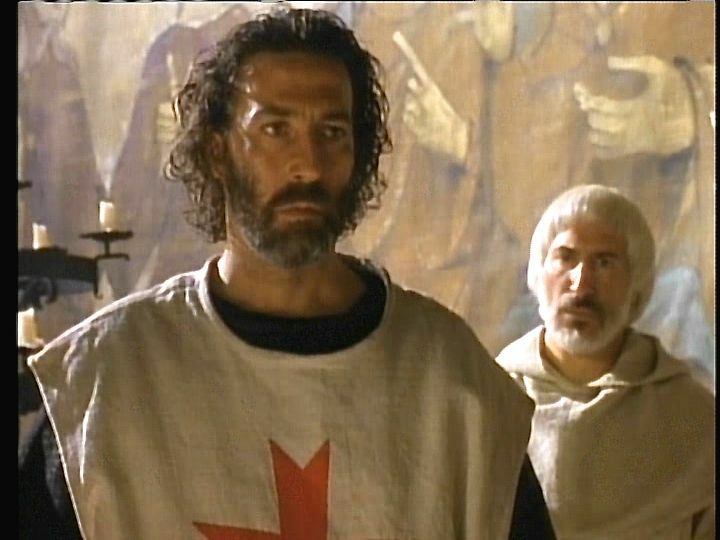 Ciarán Hinds as the Templar Bois-Guilbert, in “Ivanhoe.” Screencap by Linnet. At any rate, I am celebrating because it was three years ago that I watched the A&E/BBC miniseries of Ivanhoe (1997). I documented the ensuing symptoms in My Philosophy of Fandom, one of the most popular posts on this blog. My condition, I learned, is not a solitary one, but shared by people all over the globe. It has been dubbed “Ciaránitis” by certain esteemed experts on the topic. The onset involves hormonal disruption, excess libido, and manic episodes. 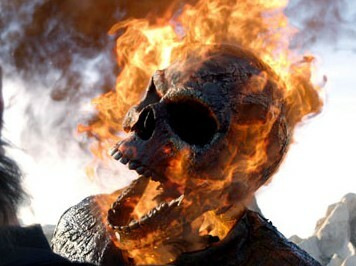 These symptoms eventually resolve themselves into eyestrain, meteoroporia (compulsive air travel) and chronic drooling. The one, the only ciaranhinds.eu. Click to visit the site. Ciaránitis has its benefits too, which is why I celebrate. Instead of a malaise, one might well call it a “bonaise.” Those who contract it experience random bursts of ecstatic bliss, make new friends all over the world, and learn everything they ever wanted to know, but were afraid to ask, about William Butler Yeats. And their Long-Suffering spouses? Well, you’ve heard of all those radical reforms Pope Francis is carrying out, right? One of them is instant canonization for partners of Ciarán Hinds fans. Monument to Yeats in Drumcliff, County Sligo, at his burial site. Click for source. Fandom is a bit like influenza, in that there are many different strains of the virus. If you’re trying to perform a self-diagnosis (that favorite online pursuit), the first thing to do is determine whether you display the Fanniversal Symptoms Pertaining to Actors. From there you can narrow the field in order to isolate the Source. Have you noticed any of the following lately? You check a certain website for new posts BEFORE your morning coffee. Your symptom-related travel involves plane tickets, using up vacation time, and/or changing currency. Certain objects of everyday life have acquired talismanic properties. You watch movies with serial killers/car chases/dragons/explosions/battle scenes/ [your least favorite content here], which previously would have been deal-breakers. You have a cardboard cutout/signed photo/action figure/poster/[insert item of your choice here] on display in your office at work. You have recently taken up fiction/ painting/ drawing/ photography/ poetry/ [insert creative activity here] or your creative activity has strangely intensified. You always thought buying DVD’s was a waste of money. Until now. You now recognize multiple actors, directors, writers and cinematographers whom you had never heard of before the symptoms started. Photo by Katharine Gilbert. Click for source. If you said yes to at least three of these, you’re probably infected. You’ll need to prepare yourself for the psychological impact, which typically manifests itself in four stages. Stage 3: Acceptance. This is the most difficult stage for partners and friends, who suddenly find themselves bombarded with nonstop discussion of the Infection and its numerous Vectors. Caregiver respites are highly recommended. Stage 4: Integration. At this stage, you will achieve better management of the symptoms with the help of support groups online. You’ll decide that life is too short to feel ashamed of something that makes you happy. You might even start a blog. “But Linnet,” I can hear you saying. “How can I tell whether I have Ciaránitis or one of those many other strains of the bug?” Here’s how, in five easy questions. 1. Which of the following quotes is NOT by Ciarán Hinds? A. You never really know why they choose you but, again, there must be some sort of connection. B. Talent is an accident of genes, and a responsibility. C. For all the acting you can do, the actual soul of someone does somehow permeate through their work. D. There’s work to do along the journey. 3. Which is closest to the proper pronunciation of his first name? 4. Which A-list actress has he NOT worked with? 1. B is by Alan Rickman. 2. C. He claims he was the front half. 3. C. People who know Irish often think it’s D, but he pronounces it like C.
4. Trick question; he’s played opposite all of them. If this question annoyed you, you’re definitely a fan! If you got all the questions correct, you either have an acute case of Ciaránitis or (heaven help you) live with someone who does. 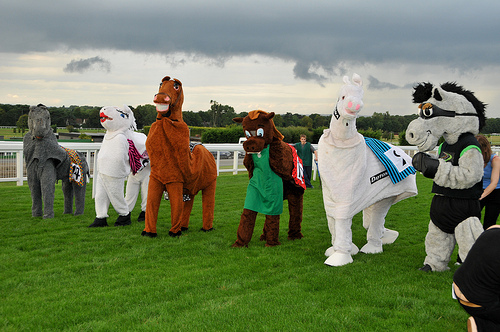 The pantomime horse race in Elmbridge, UK. In February, the celebration continues. 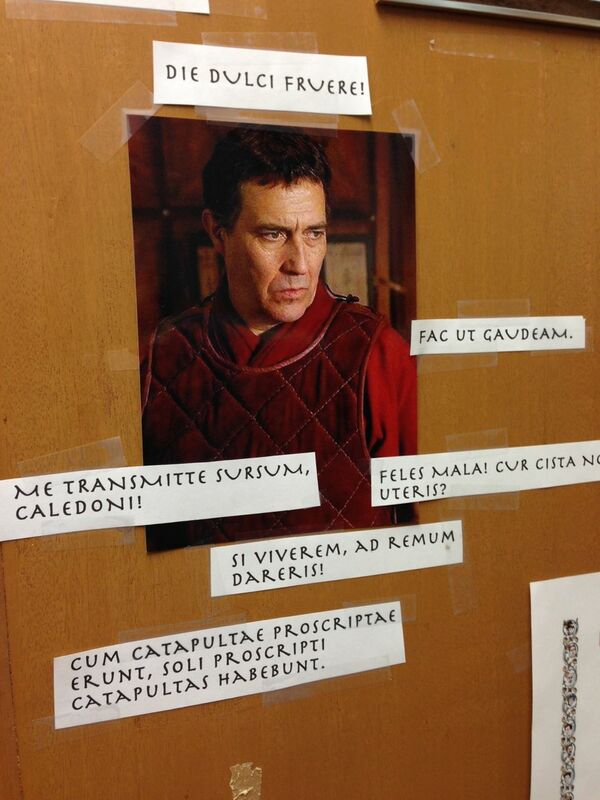 Come with me to Ciarán Hinds Fanniversity! Wonderful post. Congratulations on your fanniversary (blogiversay?). You’re an early morning poster, so one of my rituals before coffee is reading your very blog. Linnet’s observations on her fandom for Ciarán Hinds is so relevant to me, and probably to you. Thanks for the reblog, Perry! I am fascinated by how much we fans have in common, in terms of the emotional journey. What a joyful post. It’s right up there with “The Belfast Pill” as one of my favorites. Yes, I did scratch my head over the trick question, and thought, Linnet, you’re such a minx. Just yesterday I was looking at the CH site when my hubby walked by and asked what I was looking at. When I answered, his eyes glazed over, there was an “ah, yes”, and walked away. My own LSH is a lovely, understanding man too. Thanks Ellen. I think you hit on the important word, “joy.” The LSHs are the best, aren’t they? Should the positions be reversed, I don’t know if I could be so generous. Happy beginning of the fourth year! And you may yet turn me into a Ciaran Hinds fan. Ha, ha! I’ll keep working on you 🙂 And many thanks for the good wishes. Brilliant post, Linnet – and congratulations of having managed your Ciaranitis. As a survivor, you are a gleaming example – because evidently the affliction has not affected your brain but you are a wonderfully witty and clever woman. For your readers I would also like to point out that while Ciaranitis is not necessarily infectious to *all* people you come in contact with (most Y-chromosome carriers seem miraculously immune to it), it is nonetheless dangerous as increased exposure to you and your blog may result in multiple crushitis. Aww, thanks Guylty. You are a shining example of the best that a fan can be. I have found much inspiration in your joyful, intelligent and generous approach to fandom! Sheeesh. This is about *you*, not me. Besides, I am only taking my cue from those before me. Come come Guylty, you must learn to take a compliment 🙂 You are unique! You better watch out or I’ll start leaving random effusive compliments on your blog!! 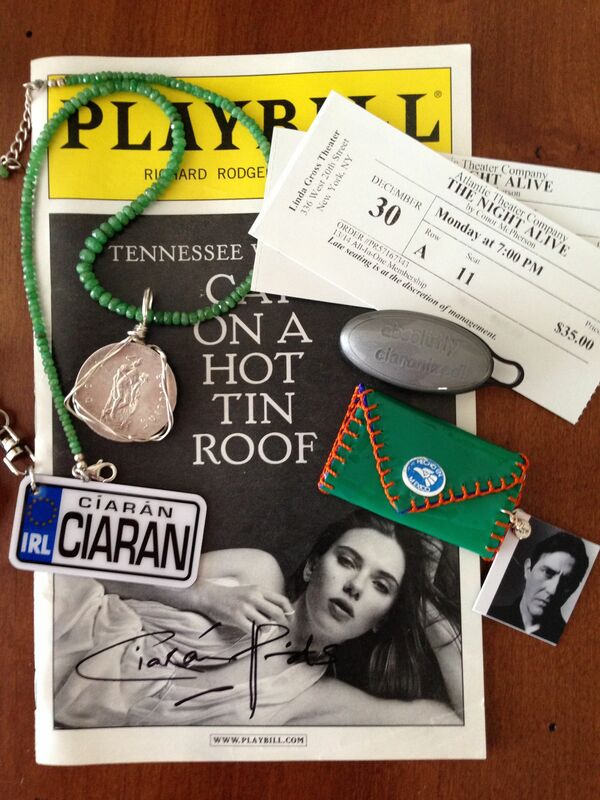 Whilst I may not suffer from Ciaranitis, I enjoy your joyous and fascinating posts on him. This one cracks me up. Love your photo board at work! A self aware fan is surely a good thing, no? (BTW fanny, tee hee….) I do think the LSH had earned a place in heaven. TEN Amazon purchases a month??? I can’t manage for the life of me to keep below that WITHOUT suffering from such an affliction. Yet. One is never safe, I realise. Well, for me that’s a lot. Especially if they are all DVDs 🙂 But yes, you should stay on the alert. You might wake up morning and find that you have somehow been transformed into a Keanu Reeves fan. He was something special. I have “Need You Tonight” on my workout playlist! brilliant!!! and many congratulations for the anniversary and to many more to come :-)I love this and have a whole backlog of saved links to your posts to catch up on by the way 🙂 And those symptoms are scarily universal! I didn’t know whether to laugh or hide while reading. And i can’t believe in how many films i have actually seen him!!!! 🙂 great taste you have! ah you see that is the one i haven’t seen and now i MUST see 🙂 i hear amazon calling again! it’s like a leach that lives on my card! Thank you Linnet! Great summary of the Ciaranitis! Eventually ;), I LOVE the keyring ;O, where do I have mine? I must definitely watch Ivanhoe, and I didn’t know that he was in Excalibur! May I ask what’s the connection between Mr. H. and Yeats apart from the nationality? He and Liam Neeson are both in “Excalibur” though they don’t have large roles. Helen Mirren is in it too! I have heard Tom Hiddleston reciting that poem, I’d love to hear it by Mr. H. Thank you for your explanation! I’m late as always, but not too late I hope. Congratulations on your fanniversary! (Fanny Price sounds like a sign in a brothel.) I love your posts. You write with great intelligence on fascinating topics and Mr Hinds is just the gorgeous gravy on the delicious cake of your blog….icing, I should have gone with icing there. Ciarán is sweet, delicious icing. I raise a glass of cheap champagne to you and wish you many more years of happy fanning! LOL about the “Fanny Price”! What I wouldn’t give to have this kind of knowledge about any one subject, Linnet. I’m thinking I don’t even know this many facts about my own life–which just may be a strong indication of a life not well lived, right? I have enjoyed all the myriad blogs you’ve posted about Mr. H, and countless times I’ve been introduced to something worthy and wonderful to watch. This is the best perk of someone else being president of the fan club–they happily and thoroughly sift through the rift raft to find you the perfect pearls. Congratulations for sustaining a die-hard interest in someone that is truly worth the effort. Just reading this post so apologies for the delay in my reply! Almost exactly four years after you contracted your malady, I also acquired the very same illness through the very same carrier – the 1997 “Ivanhoe.” I am now convinced that this is a communicable virus transmitted directly to the optic nerves from this miniseries and a number of other infected works. The symptoms: frighteningly IDENTICAL. Increases in creative activity, hormonal activity, etc. ; massive, apparently spontaneous and inexplicable growth of my DVD collection; knowledge of actors, directors, theatres (never much of an interest before); travel plans over which I am excessively excited, the ability to answer all of the above questions…need I go on? Thanks for adding to and sharing the joy, Linnet! Haha! I agree, the similarity in symptoms points to a virus. A “virile” infection, perhaps? It’s the only bug that does you good instead of ill 🙂 Thanks for reading, Karen!